Abbey Road is the eleventh official U.K. album and seventeenth U.S. album released by The Beatles. Though work on Abbey Road began in April 1969, making it the final album recorded by the band, Let It Be was the last album released before the Beatles' dissolution in 1970. Abbey Road was released on 26 September 1969 in the United Kingdom, and 1 October 1969 in the United States. It was produced and orchestrated by George Martin for Apple Records. Geoff Emerick was engineer, Alan Parsons was assistant engineer, and Tony Banks was tape operator. It is regarded as one of The Beatles' most tightly constructed albums, although the band was barely operating as a functioning unit at the time. Rolling Stone magazine named it the 14th greatest album of all time, even though the magazine initially gave the album a mixed reception: Their November 15, 1969 issue features two very different reviews - a strongly negative one from Ed Ward, who particularly criticizes its overproduction, and a rave review from John Mendelsohn. Abbey Road became one of the most successful Beatles albums ever. In the UK the album debuted straight at #1. Abbey Road spent its first 11 weeks in the UK charts at #1, and then was knocked off just for 1 week to #2 by the Rolling Stones debuting at the top with Let It Bleed. However, the following week—which was the week of Christmas—Abbey Road returned to the top for another 6 weeks, completing 17 weeks at the top. In all it spent 92 weeks inside the UK Top 75, making a big re-entry after over 16 years in 31 October 1987, when it was released for the first time on CD and reached #30. 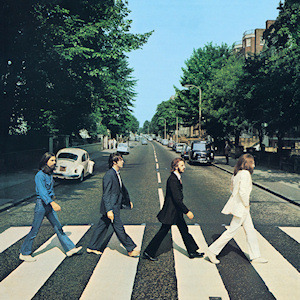 In the UK Abbey Road was the best-selling album of 1969 and the fourth best-selling of the entire 1960s, and the eighth best-selling album of 1970. Reaction in the U.S. was similar. The album debuted at #178, then moved to #4 and in its third week to #1, spending 11 non-consecutive weeks at the top, but was not the best-selling album during the Christmas week. Abbey Road spent a total of 129 weeks in the Billboard 200, re-entering the charts at #69 on 14 November 1987 when it was released for the first time on CD. It was the 4th best-selling album of 1970 in the US and is now certified 12x platinum by the RIAA.